This is a rustic but delicious recipe I was inspired to make after reading Fergus Henderson’s The Whole Beast: Nose to Tail Eating. Fergus has a recipe for pheasant and pig’s trotter pie, and this is reasonably close to that recipe, but not quite; I can’t help messing with things, I guess. All this recipe is is a thick stew of pheasant, pork broth and shredded pigs trotters, with some potatoes thrown in for heft and a top crust that is essentially a pie crust with some goose fat in it. Can you use chicken? I suppose, but find a stewing hen from an ethnic market. The key to success here is really the pig trotters. No, there’s no real meat on them, but I can think of nothing that has more ooey collagen and rich fat than a hog trotter; you can get them from a real butcher if you ask ahead of time. You first make a broth with the trotters, along with other cheap pig bits (tail, ears, etc), carrots, celery, carrots, and herbs. This broth becomes the glue for the stew. There’s so much gel in it that the pie sets up even while hot. Trust me, it’s not like Jell-O — although it is when cold. It’s really the perfect foil for the pheasant, which, while flavorful, can tend toward dryness. If you don’t have access to pig’s trotters, I suppose you could use other bones, or you could slip a sheet of gelatin into the broth. I haven’t tried this, though. Make this dish when it is cold. It is a perfect lunch after shovelling snow or walking in a winter wood. One more thing: Guinness stout is probably the best accompaniment I can think of for this recipe, but I suppose you could drink a burly, tannic wine. Maybe a Petit Verdot or a young California Cabernet Franc? Pick the skin, fat and other yummy stuff from the trotters and cut them into rough, 1/2 inch pieces. Mix the flour and salt, then the butter in a food processor. The butter must be very cold, so put the chunks in the freezer for 15 minutes before pulsing the mixture together 4-6 times. After this is done, add the goose fat or lard and pulse a few more times until the mix looks like polenta. Add 3-5 tablespoons of water to the dough and buzz it a few times. Remove and clump it into a ball, then flatten it somewhat/ Dust with flour and cover in plastic wrap. Refrigerate the dough for at least 30 minutes. Brown the pheasant pieces well in the goose fat or lard — if you happen to have pheasant fat, rendered the same way as for wild ducks, this is ideal. But I do not expect you to have it so this is optional. Set the pheasant pieces aside and salt them. In a shallow casserole, lay out all the herbs, spices, pieces of the trotter, potatoes and wine. Add a bit of salt. As the pheasant pieces brown, lay them in the casserole skin side up. When everything is in, add the pork stock up to the level of the skin on the pheasant and put in the oven uncovered for 15 minutes. After 15 minutes, drop the temperature to 350 degrees and cook for another 30 minutes. Remove and let everything cool. Don’t turn off the oven. When you can, pick the pheasant meat off the bones and chop the breast meat into large chunks. Return to the stew. You can eat it at this point or top it with the crust. If you are making a proper pie, roll out the dough flat enough to cover a pie dish. 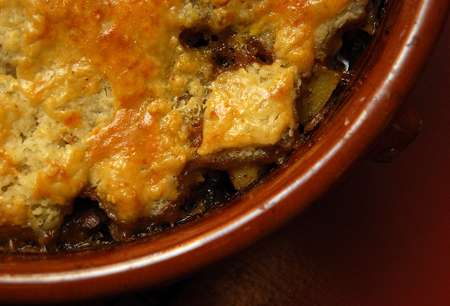 Fill the pie dish with the stew — leave about 1/4 inch space from the top — then cover with the crust. Cut some holes in the top to let steam escape. Paint the crust with the egg yolks. Bake in the oven for 45 minutes; the crust should be nice and brown. Remove and let stand for 10-15 minutes before serving.